Belfalas is the fairly settled mountainous peninsula that gives the Bay of Belfalas its name. It is also the domain of the princely line of Edhelion, and is therefore often referred to as Dor-en-Ernil ('Land of the Prince'). Although Pelargir and Lebennin have always been the heart of southern Gondor, the neighboring land of Belfalas prides itself as the only dwelling of the Dúnedain-in-Exile where the legacy of the Faithful never grew dim throughout all the long tribulations of the Third Age. 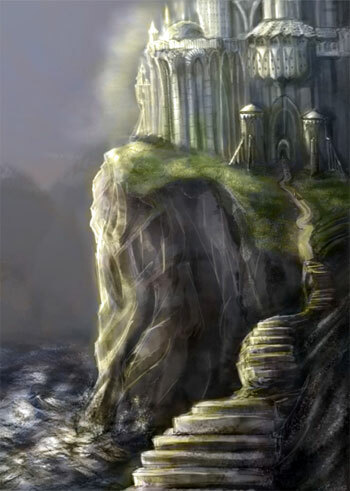 The princely line, favored by Uinen in local legends, could even boast of being more ancient than Line of Elendil. 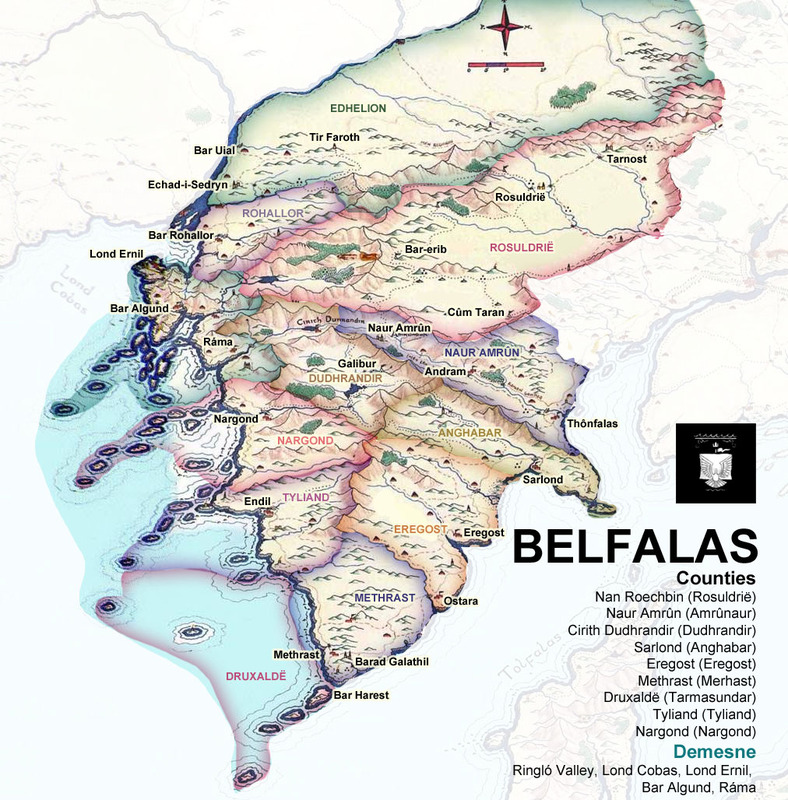 Belfalas was named in antiquity, either by elves of Edhellond or by faithful Númenoreans. The element falas is a Sindarin word for "shore" or "beach", while bêl was the name of the region in the language of the original, pre-númenorean inhabitants, having similar meaning. So Belafalas is in fact a combination of two words with the same meaning in different languages (Rivers & Beacon-hills, p. 15-16). Belfalals and Dor-en-Ernil are used interchangeably, though it must be noted that the princely domain extend further north than the mere peninsula. The coast is actually usually referred to as i-Falas ('surf-beach') or Then-falas ('short beach'). The great bay between Umbar and Andrast is called the Bay of Belfalas (Côf Belfalas), or simply of Bêl (Côf gwaeren Bêl, 'the windy bay of Bêl'). The land has been populated by Númenóreans since the Second Age, and is one of the very few areas where intermingling with indigenous peoples has been scarce. Dúnedain and Gwathuirim exist as two separate and unmixed communities throughout the history of the peninsula. Indigenous population appears to have been very small or nonexistent during the initial colonization. The nadir of princely authority over eastern Belfalas came during the Kin-strife, when the folk of Linhir sided with the Traditionalist League against the prince's will, and Castamir nullified the latter's right to appoint the town's squire. Although Castamir was later deposed and much of his legislation was declared null and void, the township of Linhir retained its independence, and, along with the newly founded County of Gilrain, became part of Lebennin. Although the soil of Belfalas is rich, arable land is scarce (with the important exception of the Ringló valley). The mountainous zone lends itself to shepherding, though in Belfalas the sheep are raised to feed the nobility, not for the harvesting of their wool. The secluded mountain valleys sustain some of the mightiest trees in southern Gondor. The Ered Torthonion are primarily a home to pine forests, and the great pines are coveted ship-building material. Animal life is abundant, though there are few deadly predators, save for the wolves, which generally keep to themselves. Deer and boar are plentiful in the mountain valleys. One species of bird unique to Belfalas is the fabled kirinki, which the Faithful brought with them when the remnants of the Guild of Venturers settled on the northern coasts of the Bay. There are several other tell-tale signs of early Númenórean colonization: tomato fruit and sweet galenas (westmansweed) are found here more abundantly than anywhere else in Middle-Earth. The inhabitants of Belfalas take pride in their religiosity and history as the leaders of the Faithful in Gondor. They are diligent, stern, ultra-conservative and proud of their perceived independence. They are also courteous to outsiders, though this courtesy does not extend to non-dúnedain. The all-important connection between land ownership and blood lineage is held as sacred; it has encouraged and enforced a strict ethnic division among the inhabitants of the peninsula, and also estranged them from other Gondorians. Dor-en-Ernil is not only the oldest feudal domain in Númenórean history, but the archetype of the very concept of feudal power itself. What distinguished this grant from earlier Númenórean models of royal patronage was not its substance, but its legal form. 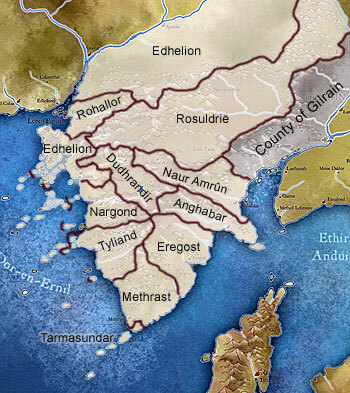 Without Edhelion's acceptance, Isildur and Anárion would never have been acknowledged as the rightful rulers of Gondor, as so would have lacked the legal power to grant land in the first place. Unlike the fiefs bestowed by future kings, Elendil's grant to Edhelion could not be revoked without seriously undermining royal legitimacy in the eyes of the Faithful. Paradoxically, then, Edhelion's submission to the authority of his future king was at the same time as uncoerced, legally binding agreement enacted between political equals. The reciprocal quality of this deed, albeit under less "equal" terms, subsequently became the essence of power in Belfalas under the prince. The mutual obligations of alliance in war and friendship in peace imposed constraints on both the prince and his enfeoffed retainers, preventing either party from violating the oaths on which the continued legitimacy of their own claims rested. The only true threat to the stability of Dor-en-Ernil's system of land tenure could come from inheritance disputes amon the eligible heirs to a given estate. Though it is an essential component of the feudal oath that an enfeoffed knight name only a single male inheritor to his estate, there has been several rebellions rising from convoluted inheritance disputes. The principal threat to Belfalas has always been by sea, and the prince developed the maritime defenses of his domain primarily in response to the spread of Corsair warfare after 1500 III, though the princedom had possessed a small number of warships prior to the Kin-strife. Current (1665 III) Captain of the Princely Navy, aerhîr Marahil Tarmasundar, has six cairons, one palanrist and 14 small coastal patrol craft in his disposal. In case of an invasion or war (not counting the numerous "civil wars" between descendants of Eldacar and the Castamirioni League), the prince of Belfalas could muster 5,000 armoured men-at-arms and 20,000 militia. Marahil Tarmasundar, aerhîr of the navy and count of Druxaldë. Marahil is the most unconventional of the peers of Belfalas. Given to spells of brooding, he is distant, intellectual and cunning. Prince often entrusts him with missions requiring secrecy and surprise. Tales of his travels to Umbar and Harad inspire the Court, and in wartime he frequently leads raiders across the bay. His given name was Ilzagar in Adûnaic. Marahil carefully guards his private life. It is rumoured that he is interested in magical spells, and can control winds and currents at his will. In his youth he was captured by Haradrim when sailing south of Vamag. Tortured for days before his release, Marahil never broke. To this day he bears the scars that testify his resolve, as he is keen to boast. He has a harsh, manful appearance, shoulder-length dark hair and long mustache. He lives in his manor at Bar Harest, an island at the southernmost point of Belfalas. Arukhôr of Rosuldrië, Lord Tarnost. Arukhôr hails from an old and very conservative Dúnadan family. An exceptionally courteous lord, he dislikes change and insists on social formalities and precedence. His slight dislike of Elves and other "unnaturals" is tempered by his caution and restraint. He is an ambitious man, skilled in mountain warfare, and speaks Dunael. Arukhôr and Marahil have a bitter rivalry. 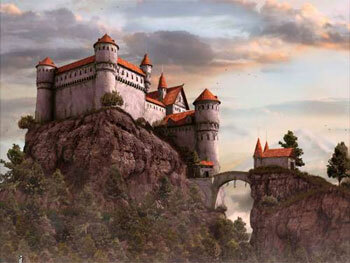 He lives in his ancestral manor of Rosuldrië, on the eastern side of the Hills of Tarnost. Celdrahil Edhelion, Grand Prince of Belfalas. Celdrahil is a multifaceted fellow, who changes roles with ease. A central figure in the social life of the Court, he is nonetheless unhappy with pomp and circumstance. Prince Celdrahil is a family man. He married the lady Meriel of Naur Amrûn (younger sister of queen Míriel) in 1626, and together they have raised six children: a son and heir Edrahil; Edrahil's twin sister Merien; rebellious Celdrion; their young daughter Edhetariel (Queen's handmaiden); and two boys who died in the Plague, Arathil and Arodion. Celdrahil is middle-aged, of average height, with light grey eyes and layered black hair with a hint of grey. He has lost two of his front teeth in a riding accident.